In 2010, there were 6 new posts, growing the total archive of this blog to 55 posts. There were 4 pictures uploaded, taking up a total of 84kb. The busiest day of the year was March 5th with 255 views. The most popular post that day was 10 to 11. The top referring sites in 2010 were daniweb.com, codeproject.com, twitter.com, facebook.com, and networkedblogs.com. Some visitors came searching, mostly for ramy mahrous, business intelligence performance elearning, “ramy mahrous”, bi c#, and business intelligence keywords. I won’t recommend you to go to http://support.microsoft.com/kb/975055 and waste your time installing SQL Server 2008 SP 1 because it won’t solve the problem. Close IE\Explorer windows or anything you can open after doing your installation process 🙂 yes that’s it… weird..
To solve the problem I had to disable the antivirus (BitDefender -what I’ve-) seems it prevents the windows installer to start any services! to over come this prevention stop your antivirus. SQL Server Setup has encountered the following error: The given key was not present in the dictionary..
Open it without run as administrator it will look like as you want. Excuse me, this post not related to BI which my blog talks about! 2- NOW 10 to 11 supports migrating numbers with any known format. 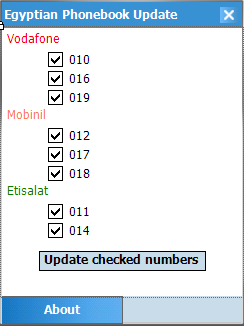 After the decision of The Egyptian Agency for Telecommunications to change cell phone numbers 11 numbers instead of 10 http://www.masrawy.com/News/Egypt/Politics/2010/march/4/mobinil_vodafon_etisalat.aspx , I found it too tough to change your contacts number manually so I’ve developed this application to do that for you. Simply my application 10 to 11 (thank you my mother, she suggested this name) iterates all outlook contacts not SIM contacts and modify the mobile phone number of your contacts to the new format\schema which The Egyptian Agency for Telecommunication announced earlier. And you can choose what to change to the new format…. I mainly write this post for novices who need to begin with Business Intelligence and to be aware of the most Business Intelligence keywords thus they could read any Business Intelligence article without any problem. Business Intelligence: The art of extracting right information in timely manner to right person from raw data, it doesn’t depend on specific technology but very wide of technologies depend on; like Data Mining. It makes the organization realize its resources, potential and give the Big Image* to the status of its goals. Operational Business Intelligence: Business Intelligence Systems build on the same Business Intelligence process ETL, Analysis then Reporting but they don’t care about KPIs and Measures more than data listing. Tactical Business Intelligence: Business Intelligence Systems build on the same Business Intelligence process ETL, Analysis then Reporting beside they give a wide solutions to tactical managers who can use them to get the most of KPIs (Profit in dollars, number of CRM tickets, etc) to take their organization step towards its goals. Strategic Business Intelligence: Business Intelligence Systems build on the same Business Intelligence process ETL, Analysis then Reporting it helps the top management get the status -very brief status- of the organizations and its step towards its goals. Hierarchy dimension: Dimension has self-relationship like time dimension we may see Year, Quarter, Month, Week, Day and may be more deep details. Simply everything with more than one level (deparment employee). SQL Server is unable to connect to server ‘Your server name‘. It always appears as you change the instance name manually or network administrators change the computer name. sp_dropserver ‘Old server name’ — you got it from pervious select. sp_addserver ‘SQL server instance name’,’local’ — the name of current instance.